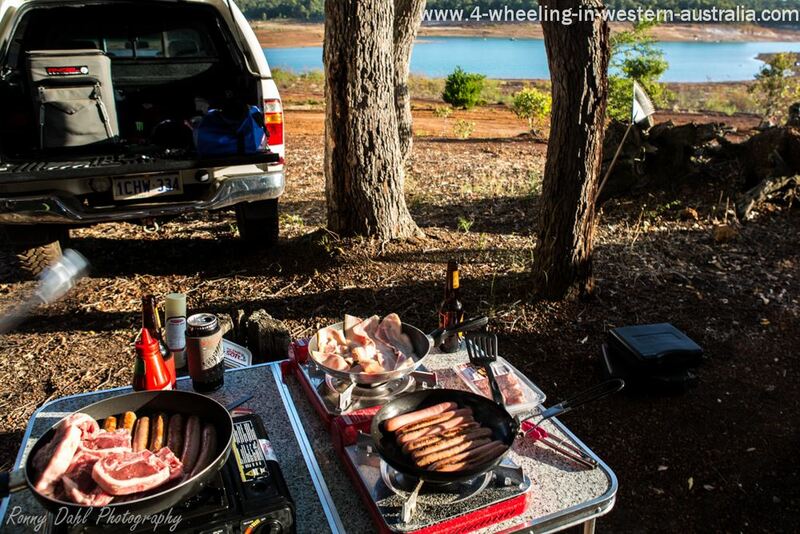 Depending on what kind of camping or adventures you are about to embark on, what you decide to cook or eat will be very different, it would also come down to the individual. Family camping usually entails staying at one or maybe a few places for more than 1 night at any time. This would allow extra time to cook as the tents will be setup for a while. 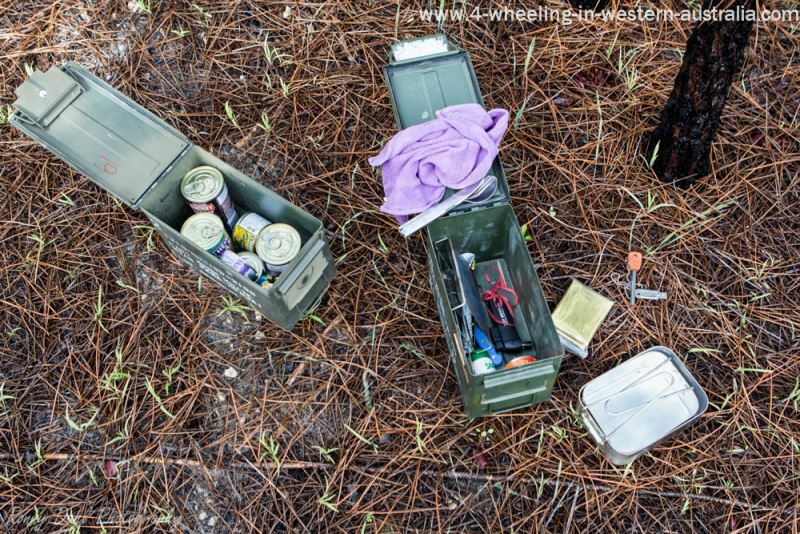 If it’s just an overnighter on the beach or in the bush simple menus like canned food, steaks, sausages and prepared camping food would be the best option. Cooking up a big meal on an overnight stay can take the fun out of the camping unless you really enjoy cooking while multitasking. Whatever the camping plans are it really pays to keep the meals simple and fast which can still be very tasty, a 3 course meal is far too much mess and effort at the camp site. Easy lunch cook up in the sand dunes. Bringing extra food and water is a smart idea If the short trip turns into a longer stay due to vehicle problems the extra food and water will make the situation a lot more comfortable and bearable. I keep a box of canned food stored away in the vehicle at all times with some fire lighters, matches and an emergency blanket just in case. Placing this in the vehicle as a permanent thing and you don’t have to worry about packing it for every trip. It’s just there for peace of mind. With canned food you only really have to check the expiry dates once every year. This includes overnighters, long weekenders and short trips. Canned food like chunky meat soups, curry’s and hot pots are great and fast to make. It’s easily prepared over the camp fire or a gas burner and within minutes your meal is ready. If one can is not enough simply mix in another can of vegetables, cocktail sausages or even canned potatoes, its fast, cheap, takes up very little space and is very easy to clean up. Other quick and easy meal options are noodles in cups which only require a bit of hot water. Breakfast camping foods are easily prepared, anything from canned spaghetti, baked beans, fried eggs, bacon, toast and small cereal boxes can all be done in a hurry before packing up and heading out. It can be a bit pointless for everyone to cook their own share of food if everyone is having the same, the duties could be spread out. If having bacon, eggs and toast one person could cook the eggs while two others take care of the rest. It’s near impossible to fit 3 person's worth of bacon, eggs and toast over one gas burner. Bring a plastic 20-25lt jerry can for drinking water and cleaning up is very effective and saves you from storing multiple bottled water, it’s only a short trip so one jerry can should be sufficient for both cleaning and drinking. Soft drinks and beer is always best in cans, cans are lighter, smaller in size, can be stacked and don’t shatter. Cans can be crushed and take up very little space in the rubbish bag. Glass bottles can & will shatter in the ice box, esky or DC fridge. This has happened too many times on previous trips, it’s really not nice to have shattered glass and beer sprayed all over the contents of the fridge and seeping throughout the foods. Cans of drink can still get pierced in transport but it's far less common. Too many people bring glass bottles into the bush. I say this due to the shattered glass we have seen far too often at camp sites, rest areas in the bush and even on the beach. Consider people bringing kids to these beautiful remote beaches only to step in broken glass. If a bottle breaks it’s near impossible to pick up every glass shard so use cans when possible. SEE ALSO CAMPING WITH KIDS. Long trips are anything from one week camping to touring for months at a time, if travelling for that long you really don’t want to be eating canned food for the entire trip. For 1-2 weeks of camping you need to have a food plan. If travelling with others the cooking duties could be shared on a day to day basis and there are a few ways to share the duties. It could be cooking the same meal but sharing the tasks involved or leaving the entire cooking task up to someone else the first night and you might be cooking the next night. Either way a cooking plan needs to be in place and agreed upon before you embark, hopefully no one has special diet needs which could change your plans. While planning the camping food and cooking it’s important to think about expiry dates, saving the steaks for the last night of camping on a 2 week trip could be a huge mistake as the meat might be spoiled. Fresh meat must be eaten in the first few nights/days, if however you can “cryovac” some meat it will last a fair bit longer, just make sure that the "cryovac" food is used after any other meat is gone or you might be wasting camping food. It may sound simple but if it’s not thought of beforehand you will waste food especially meat which is why planning is very important. Touring for more than 2 weeks or months at a time and food/cooking planning is taken to another level. It must be planned in with your travels and stops. Touring for this long require resupplying and restocking camping food at weekly intervals, no 4 wheel drive that I know of can carry supplies of fresh food or canned for a month long trip. Fresh food is no longer fresh after 2 weeks of travelling. A food budget needs to be in place and the planning for food can be done a week at a time, as it can be a big task to try and work out the entire trip from the beginning to the end. Just like short trips (read above) canned drinks are much better in so many ways than glass bottles, just think of the weight and space that bottles take up. We are talking about long trips here, there might not be a rubbish bin for days or maybe a whole week which means you will have to carry your rubbish around for that long too. A weeks’ worth of rubbish is bad enough just imagine that rubbish bag is full of glass bottles, bet you’d wish it was full of flattened cans! Camping food planning is not the only thing to worry about! Drinking water and cleaning water are just as important, on long trips plan for 3 liters per person per day and then add 5-7 extra days just in case you get stuck out there. For cleaning water 20 litres should suffice for a week’s journey if used sparingly. If the trip is 2 weeks long and water refills are available on the travels you’d just need to allow enough water (plus the extra 5-7 days’ worth) to get to the refill stops. Keep in mind however that water is not available at many places in the outback and remote locations; it’s common to see signs stating “sorry no water” or “please don’t ask for water”. While planning your trip call these potential stops and ask about water supply, plan to stop at a few caravan parks during the trip, drinking water is always available at a caravan park. Remember to bring a hose and tap fittings, best to have both size tap fittings as taps can be two different sizes. Only thing worse than an empty water supply is to not have the fittings to allow a refill! 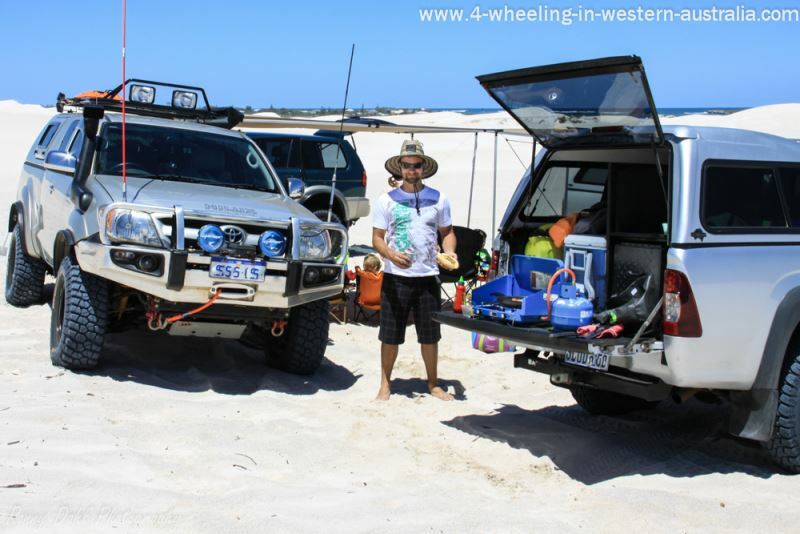 Leave Camping Food And Go 4 Wheeling In Western Australia.